Europe fares have been trending down for months (in case you haven’t been reading our blog), but if you really want to save on your next trip, make use of inexpensive entry points like Milan. The priciest part of your next European adventure is just reaching the continent, but once you’re there, the world is your oyster, as they say. From Milan, the entire continent is accessible via low-cost carriers like EasyJet or you can explore the rest of Italy by train. But whatever your destination, be sure to make your own “free” stopover in Milan. Why fly to Florence or Venice in the summer for $800+ roundtrip when you can fly to Milan for $300 less? Hop on a short train when you arrive and you will be there in just a few hours (details below) while saving hundreds. Same goes for flights to Croatia and Greece in the summer, when prices skyrocket to $1,000+ roundtrip. Look, maybe I’m biased because United Airlines flies nonstop from Newark, and I was able to snag a $450 roundtrip peak summer ticket. Several times per year, Emirates also offers two-for-one companion fares from NYC for around $499 roundtrip per person. Unless you are a United loyalist like me, I recommend keeping an eye on Emirates’ sales, because the route is served by their new A380 aircraft, providing great on-board experience. The biggest advantage, other than the savings, in booking two separate reservations is that you can build in extra time to explore Milan (or even nearby Venice or Florence, just a few hours by regional train service). This is exactly what I did before my return flights to the United States. 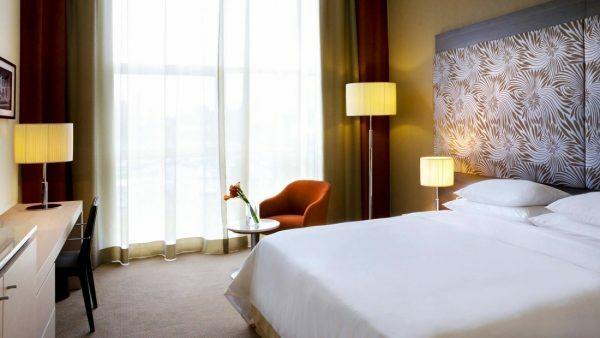 To save even more, make use of Milan Malpensa’s proximity to the city and stay on-site at the Sheraton Malpensa Airport. So you don’t feel like you are missing out on the action, the hotel is serving up classic Italian street food from regions throughout the country each weeknight in the lobby through December. Delicacies from Milan’s home region, Lombardy, will be featured in September, including mondeghili or fried meatballs (but it sounds better in Italian). The rooms are larger and more comfortable than you would likely find downtown. The Sheraton is directly adjacent to the train station, which can have you to downtown Milan’s Cadorna Station in about 30 minutes. The Malpensa Express operates every 30 minutes most of the day and tickets cost 18 EUR roundtrip (or return as they say in Europe). From Cadorna, you either walk 20 minutes to reach the Duomo and other popular attractions or hop on the metro. After exploring the city for hours, return to the hotel to rest up in the Sheraton Sweet Sleeper bed, one of my favorite hotel beds, or relax in the on-site spa. The best part is that when you wake up in the morning, just walk outside and you are at the airport. This reduced so much stress for me, as I’m the type who likes to get to the airports three hours early. Malpensa’s Terminal 2 is an EasyJet hub, where you can hop on a flight to one of 52 destinations throughout Europe. 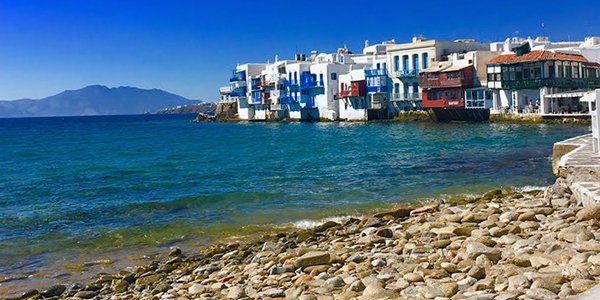 My destination of choice was Greece: Mykonos followed by Santorini. Different from the U.S., EasyJet permits just ONE CARRY-ON bag, which includes a “personal item.” This means you can bring a backpack OR a rolling suitcase, not both. To get around this, we upgraded to Upfront/Extra Legroom seating, which allows for a personal item in addition to your rolling suitcase. This proved to be a better solution for us since we did not want to have to wait for checked luggage at all during our tight connection time upon arriving in Milan. Milan’s airport authority makes it easy to transfer between flights with their ViaMilano program. As long as there is a minimum of 100 minutes between flights, if you’re switching terminals, ViaMilano offers free insurance on your transfer through AXA. If for whatever reason you miss your connection, ViaMilano will help re-book you, free of charge, up to 700 EUR for travel within Europe and 2000 EUR for travel outside of Europe (according to the Terms & Conditions page). Although only 100 minutes is required, I recommend at least two and half hours, if not more, to give yourself some extra time. If you are transferring between terminals, look for the signs for the airport shuttle bus. Although the service is available 24-hours per day, it runs every 15 minutes during the day and every 30 minutes during off-peak hours. Several major cities outside of Italy are accessible train as well, for example Nice and Zurich are between 4-5 hours. Well, there you have it! Milan offers a fantastic gateway to the rest of Europe both from a convenience and cost perspective. It’s time to get out there and see the world.